When I hear “man-cave” the image that instantly comes to mind is one of a stone cave on the side of a mountain. Inside the cave is dark with the exception of light from a stone made fire pit. Men, or should we say, cavemen, are found gathered around the fire, making grunting noises at each other, while dressed in their barbarian best. 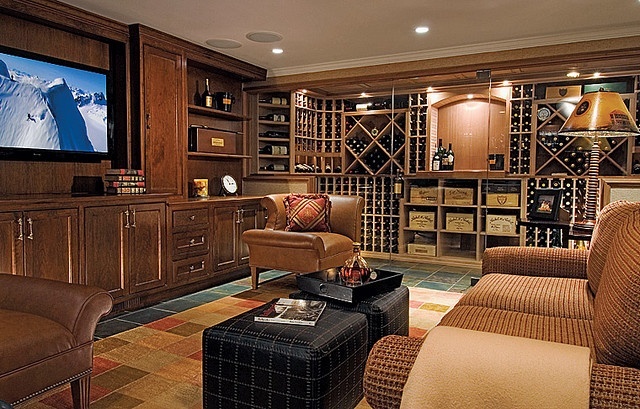 Although that’s what instantly comes to mind, when someone says “man-cave,” in regards to today’s man and his man-cave I think of an “off-limits” room, decorated with sports memorabilia, big-screen TVs, leather furniture and game tables…where pretty much anything goes, or does it? So now I wonder…What do guys do in their man-caves nowadays? Do you watch sports? Play Texas Hold’em, Ping-Pong, air hockey…video games? What do you drink in your man-cave? Are man-caves just for beer? Do you have a full size fridge or a college dorm room size fridge for your drinking pleasure? Or are you a serious man-caver and have kegs on tap? Do you have cigars in your man-cave? If so do you just sit and bask in your smoke filled room with a mini fan and a cracked open window, or have you gotten sophisticated enough to install a smoke filtration system like at the casinos? My point is, believe or not, cavemen are evolving, and with them their man-caves are too. On my latest tour of friends’ man-caves I have noticed more sophistication and sensible modifications. Instead of cans of Coors Light, Swisher Sweet Cigars, Redman Chewing Tobacco, chips and store bought chip dip, I’m starting to see mini kegs of local microbrews, small lot brandies, dessert wines like ports and sherries, still wines (Big Reds – in particular), hand rolled Dominican cigars and incredible snack food including fresh smoked fish, home made beef jerky and skewers of marinated freshly char-grilled beef, chicken and pork. This is what I consider, man-cave evolution at its best! Whatever you do, don’t get left behind. Let the evolution begin! The next time you visit Wilson Creek Winery, ask your winetender for suggestions on food, wine, port and cigar pairings to compliment your man-cave activities. As a side note and for your education- fortified wines like Sherries and Ports can be opened and sipped on for many months without spoiling. The Brandy in them helps to preserve the goodness.